If you do buy serving pieces, tablecloths or other items for entertaining, look for dual-purpose items. 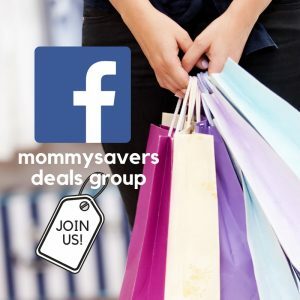 Pick solid colors that can be used any time of the year. Red is great because it can be used for Valentine’s Day. Green works well in the spring and summer. Ice blue is a trendy new holiday color that looks great any time of year. Wait to add that cute holiday ornament to your collection. 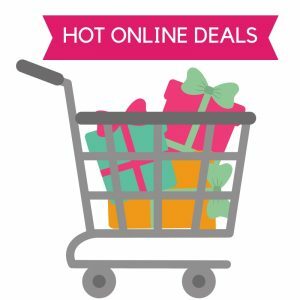 Chances are they’ll be 75% off the week after Christmas! 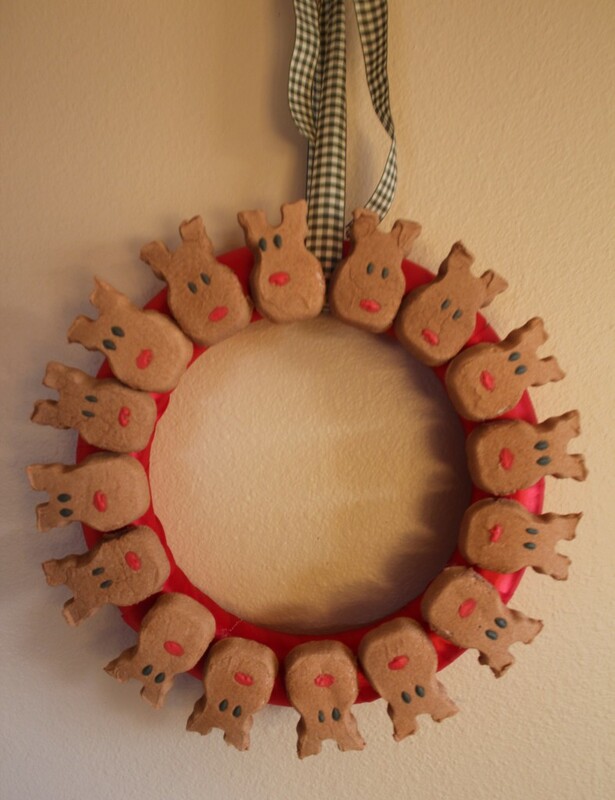 Marshmallow Peeps Reindeer Wreath – They’re not just candy! Here, Marshmallow Peeps double as decorations for an adorable Christmas wreath. 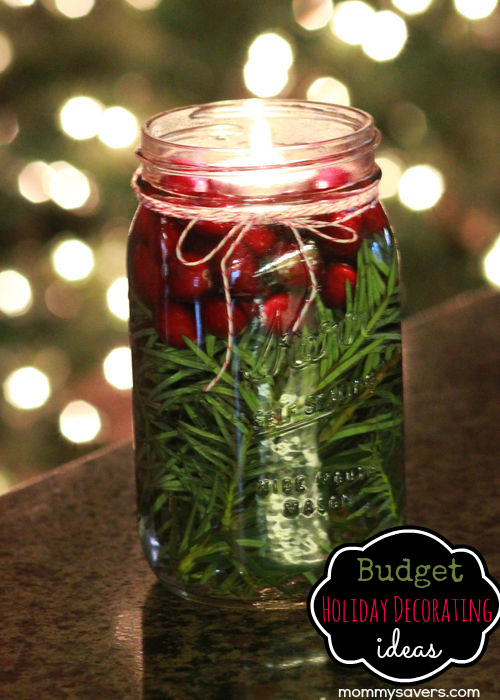 Dollar Store Memories Ornament – Here’s an easy and fun homemade ornament to make with your kids. Start a collection to remember each year with! 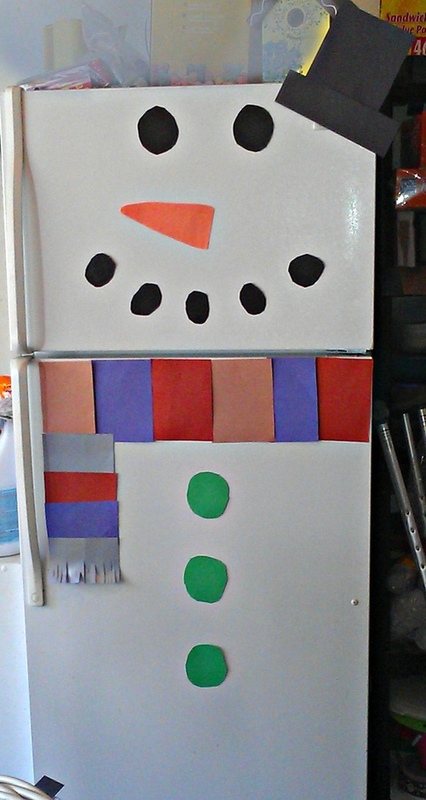 Frosty the Refrigerator – Mommysavers member 2bearsmom decorated her garage fridge like a snowman… All it took was some scrap paper and tape! 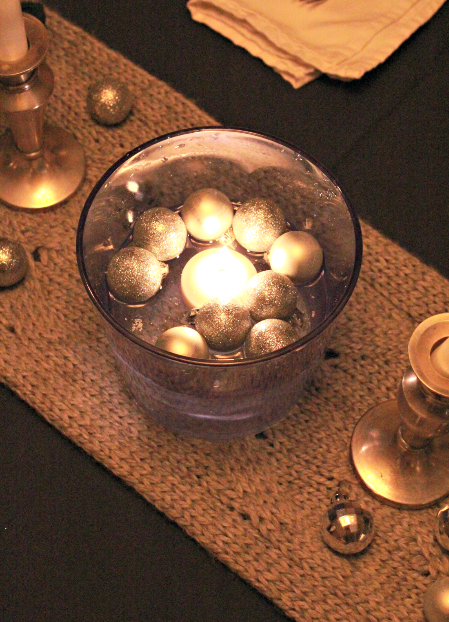 A bowl, a floating candle and some small glass ornaments look great as a holiday table centerpiece. A scarf is used as a table runner. 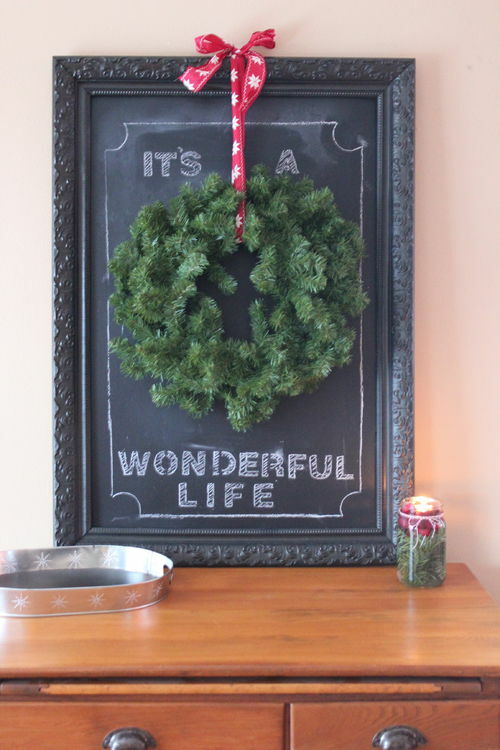 Purchase a large frame at a thrift store, paint with chalkboard paint, add a wreath or some ornaments and you’ve got inexpensive wall art. 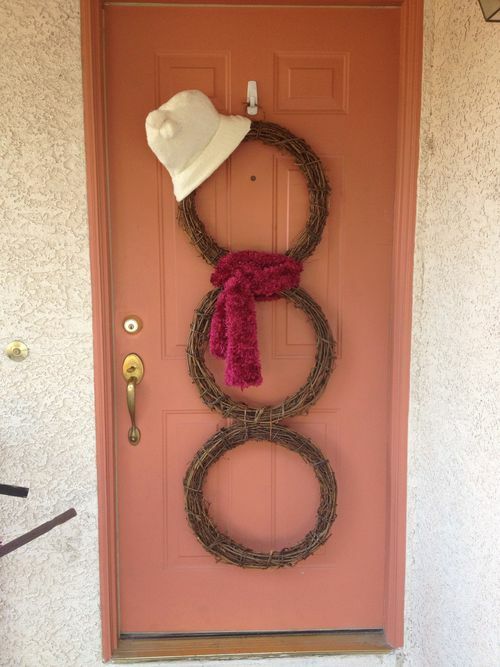 Thanks to our forum members for sharing their ideas in the Frugal Homemade Christmas Decorations thread. How festive is your neighborhood? Do you have Christmas trees that are other colors than green? 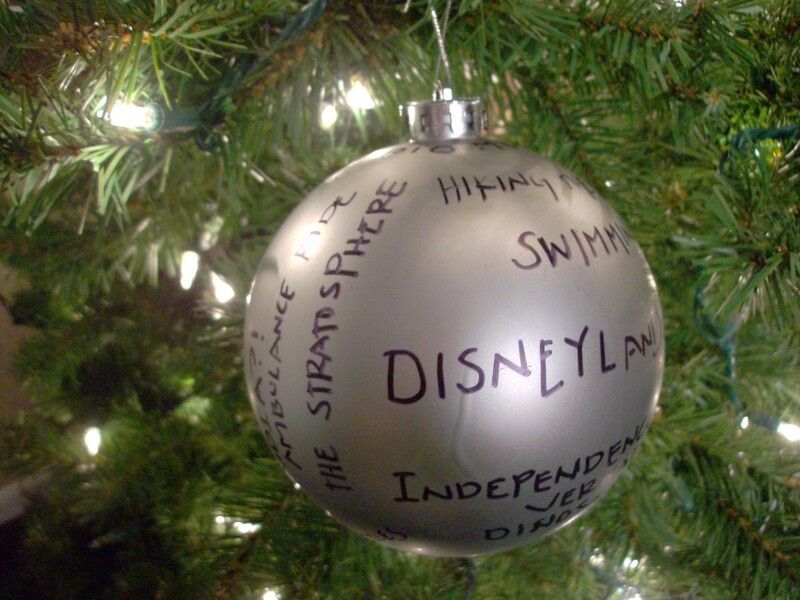 Do you have a theme for your Christmas tree/trees? 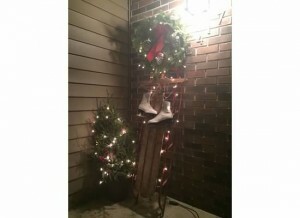 I would love to hear some free project ideas for kids to make outdoor Christmas decorations. My oldest kids are 3 & 5 and they adore the outdoor lights, etc, but we aren’t going to use anything more than our 2 sets of solar lights this year as we don’t want to increase our electric bill at all. I’d love to come up with some ideas for things we could make together to decorate our yard.